That’s right. I’m dedicating this post to the travesty that is the Halifax “poutine”, found in pizza shops all over the city and delivered, along with regret, right to your door. 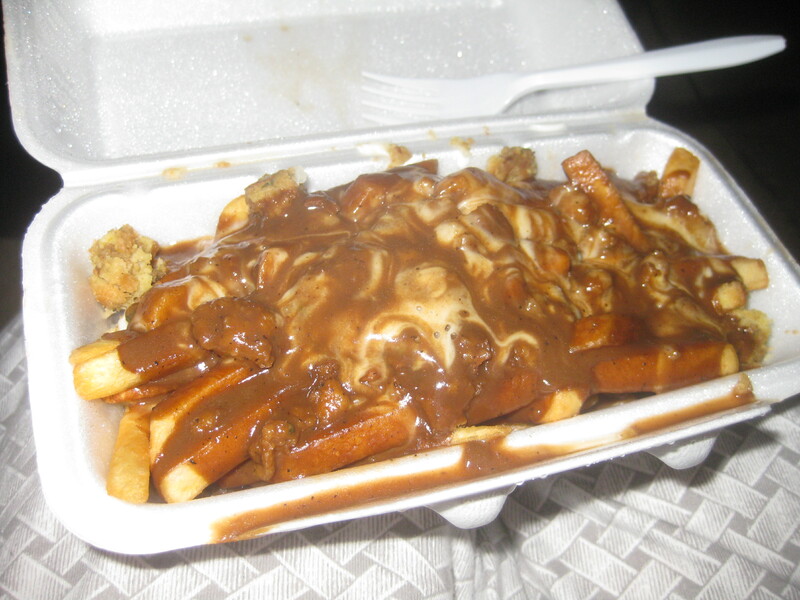 Until recently, this style of poutine was all Halifax really had. Anyone with a 2011 copy of The Coast’s “Best of Food & Drink” edition can attest to this, as Alexandra’s Pizza has won year after year in the category of “Best Poutine”. I refer to this embarrassing part of our food culture as the “Pizza Shop” poutine, because that’s exactly where you’ll find it. Pizza shops in Halifax tend to offer everything from pizza and garlic fingers, to fried chicken, fish ‘n’ chips, hamburgers, poutines, donairs, nachos, a variety of deep fried pub appys, and quite commonly, Lebanese food. Your poutine will arrive in a styrofoam container, or a tin container that was fed into the pizza oven. The French fries will be previously frozen, limp, shoe strings. The cheese will be shredded mozzarella from the pizza bar, although Greek poutines (feta cheese) are popular. If executed properly, the poutine will be half submerged in a pool of powdered gravy. Poutine aficionados are now rightly indignant and disgusted. Xtreme Pizza is known for the “stuffed poutine”, inspired, no doubt, by the Newfie delight of fries, dressing & gravy. Xtreme uses stove top stuffing rather than traditional dressing. Xtreme pizza probably offers the largest variety of poutine styles, including donair, chicken, steak, hamburger, pepperoni, and interesting combinations like spicy chicken & stuffing, pepperoni & donair, and bacon cheeseburger. This “cuisine” is best eaten while intoxicated, so that discerning taste and feelings of shame do not interfere with your palate. 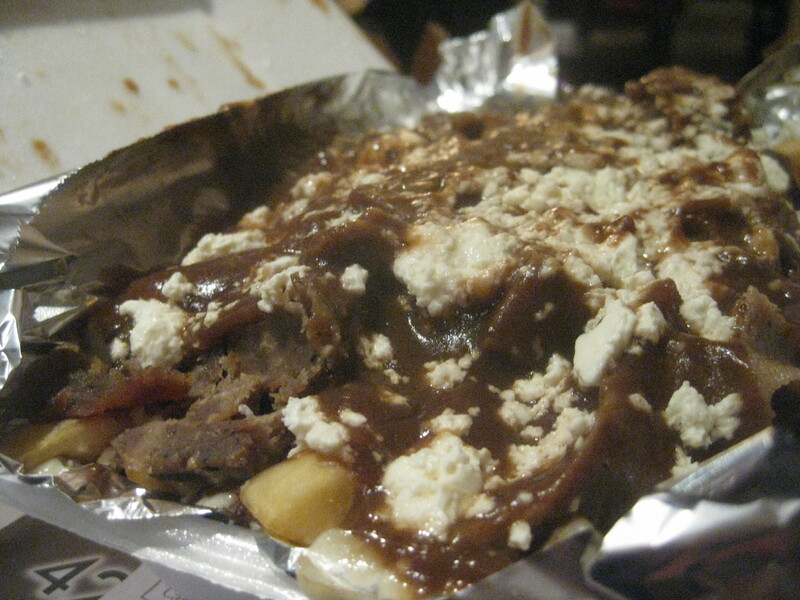 Donair Poutine (+ feta) from Alexandra’s Pizza. 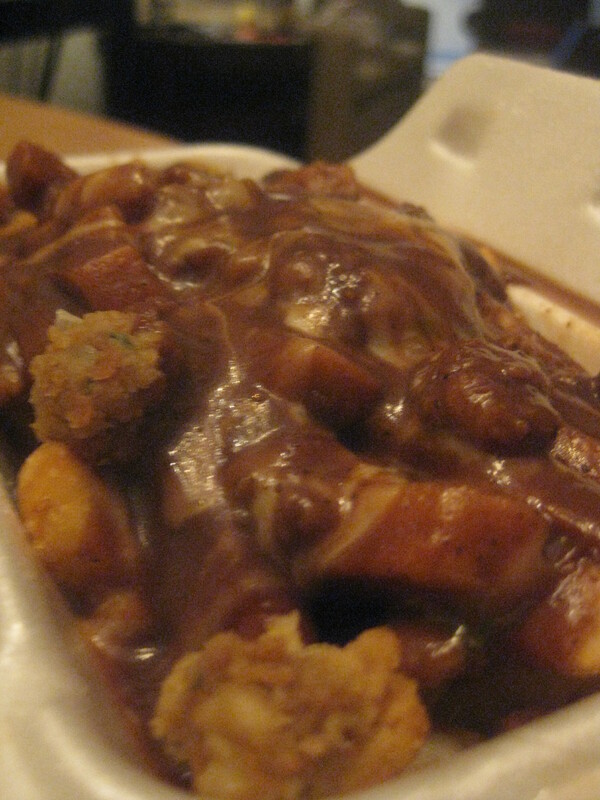 The pizza shop poutine is most always delivered as a drunken late night afterthought, or to be eaten in solitary shame. Or both, sadly. In my sober state I surprisingly found the version from Alexandra’s to be quite tasty. 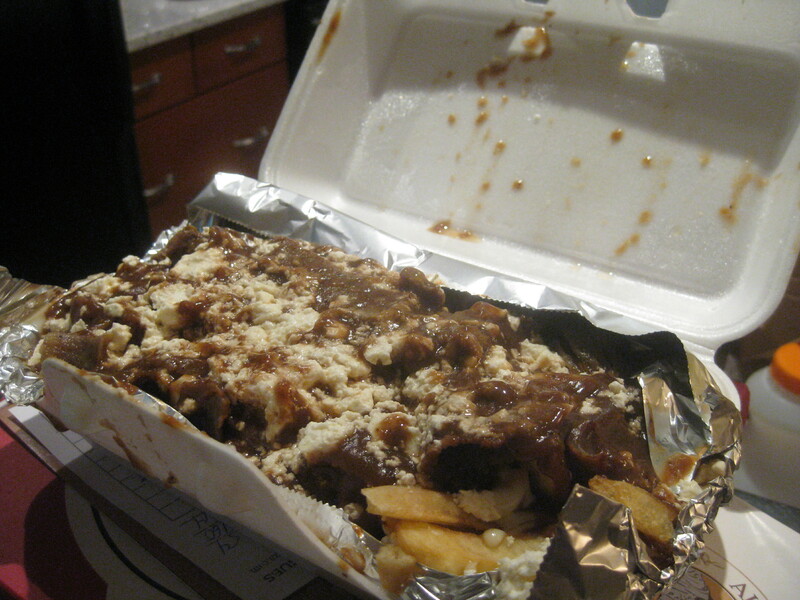 Unevenly carved chunks and slices of donair meat, tasty gravy, gooey mozzarella and salty feta. The French fries are the real deal breaker here (I mean, as a consumable, not as a poutine. The poutine deal was broken long ago). Those floppy freezer fries turn into a dry paste that sluggishly slides down the back of my throat. No amount of gravy seems to help lubricate them. Water is needed. Lots and lots of water. I shudder to think of how much fat and sodium I just consumed. I have to give Xtreme and Alexandra’s some credit. Out of all the pizza shops in Halifax they offer some of the best variety and most reliable late-night and all-day service. I know this from my days as a stumbledrunk bar star when I would get home after 4am, desperate for some mindless fat and carb indulgence. I’m pretty sure it’s safe to say pizza shop poutines are a thing of my past. Not only that, but Halifax now has semi-credible poutineries and providers who pride themselves in their fresh cut fries, real cheese curds, and house-made gravies. The gourmet poutine is the way of the future, and I’ll cover it at length… as soon as I digest this heavy lump of swallowed dignity.